So the news is out... 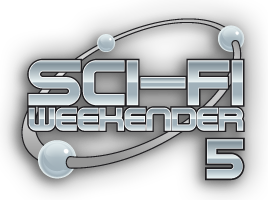 I shall be attending Sci-Fi Weekender 5 that is taking place in North Wales at the end of March. Archimedes the Steampunk Parrot will also be in attendance, as will other authors such as Gareth L. Powell, Sam Stone and Robert Rankin. I shall be hosting various panels over the course of the weekend as well as selling my writerly wares, not to mention catching up with old friends (and probably making a few news ones, if previous years are anything to go by).